Happy Thoughts Chase Out the Dark Clouds! 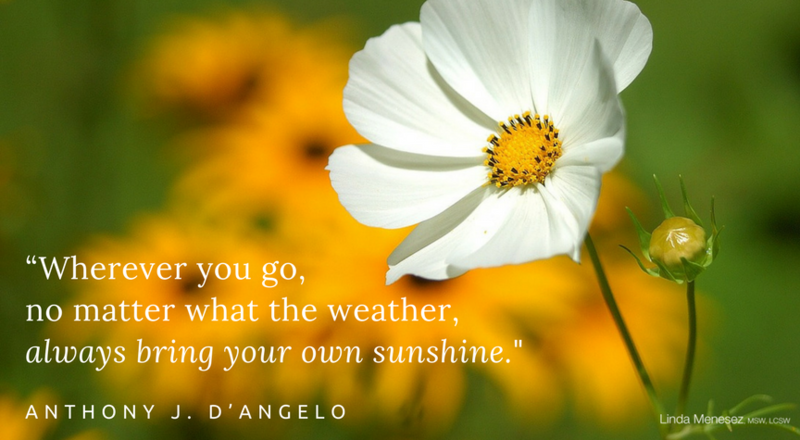 We can create our own sunshine by focusing our minds on happy thoughts! The more we begin to look for the positive things in our lives, the easier it will get. Even on bad days there are good moments. We may have to look harder to find them, but they’re almost always there. Human nature seems to more often turn our attention toward the negatives than the positives. When we ruminate on all the things that aren’t going well in our lives, though, it can fill up our minds. There’s almost no room for thoughts of the blessings of each day. We feel sad and frustrated. We can even become depressed. Change is always a process. Begin with making a conscious effort to change your focus. When the negatives come up, chase them out with thoughts of the positives. After awhile, you’ll more naturally turn toward happy thoughts. Give it a try, and see if you don’t feel a lot better. When you learn how to create your own sunshine, you’ll find yourself more often with a smile on your face. It can even be contagious! The more you smile with happiness, the more those around you will start smiling. Everyone gains! ← Too Many Hearts Are Breaking Again!